LAS VEGAS–I’m here for the last time this year, I think, to moderate a panel at Tech.Co’s Celebrate conference. It only seems fitting that I booked my flights to CES 2016 on the flight into Vegas this afternoon. Washington’s news radio station quizzed me about Google’s introduction of the Nexus 5X and Nexus 6P phones (the former is looking like my next phone), Android 6.0 Marshmallow and Pixel C convertible tablet. 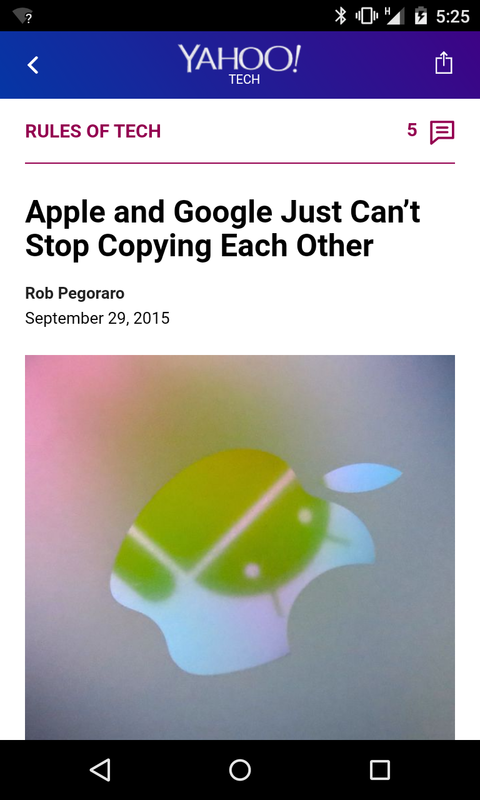 I was having a hard time coming with some kind of illustration for this reaction to Google’s news when I remembered staging a similar shot for a Discovery News post (which, of course, I can’t find now) exploring a comparable imitate-and-improve dynamic between Apple and Microsoft. I wrote an extra column for Yahoo about the shift to “EMV” credit cards and what it will and won’t do to stop the next account compromise. I know that Photos is supposed to replace iPhoto, but I’m still not sure that I’m ready to make that transition. This entry was posted in Weekly output and tagged android, chip-and-signature, credit cards, El Capitan, EMV, Las Vegas, Nexus 5X, Nexus 6P, OS X Photos, Tech.Co, Touch ID by robpegoraro. Bookmark the permalink.